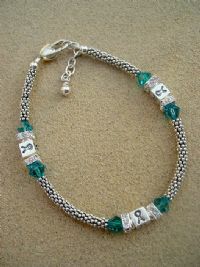 Our Cancer Awareness Bracelet is made of sterling silver & bali beads combined with sterling awareness ribbon blocks. Each cancer awareness bracelet has accents in austrian crystal awareness beads (color of your choice) then surrounded by channel set clear bling austrian crystals as seen below. This beautiful and delicate bracelet is adjustable.